Let’s Talk empowers youth to resolve conflicts peacefully and constructively, creating a culture of respect and conclusion. We collaborate with students, teachers, and administrators in the Des Moines Public School system to implement restorative justice practices to decrease the disproportionate number of students of color suspended and referred to the juvenile justice system — immediately disrupting the school to prison pipeline. 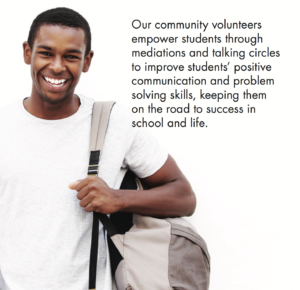 Our community volunteers empower students through mediations and talking circles to improve students’ positive communication and problem-solving skills, keeping them on the road to success in school and life.